Don’t forget about that dark chocolate left over from Valentine’s Day! 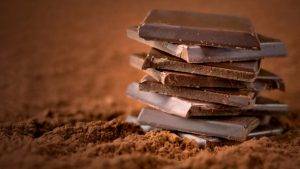 Quality dark chocolate is actually nutritious. One ounce is chock-full of antioxidants and flavanols, vitamins and nutrients! It can improve eyesight, raise good cholesterol and increase blood flow to lower blood pressure and body mass index. It’s also good for your skin as the improved blood flow increases skin density and hydration! Overindulging on this delicious treat is not recommended due to high calories and moderate sugars, but the benefits from quality, organic dark chocolate with 70% or higher cocoa content is definitely a good way to satisfy that sweet tooth!